With all of the in information out there about asbestos, it can often be difficult to tell what’s true and what’s false. If you are concerned, or find some of the information overwhelming, don’t worry. In this article, we will be debunking asbestos myths. Asbestos is a naturally occurring mineral that can be split into six different types, each distinguishable by their colour. Asbestos found widespread industrial and commercial use because of its tensile strength, low cost, sound-dampening abilities and resistance to heat damage. As such, asbestos became commonplace in the manufacture of insulation, paper, cement additives, brake pads, drywall, yarn, cloth, and even medicine throughout its history. This, unfortunately, is false; when present in concrete or some other building material asbestos is still dangerous. However, in order for it be dangerous the asbestos must be disturbed such that the tiny fibres which asbestos is comprised of are released into the atmosphere and inhaled. This is false. While exposure to asbestos on a regular basis will certainly increase the risk of developing asbestos-related illnesses and diseases, it is still very much possible to develop mesothelioma after one encounter with the substance. Most symptoms of asbestos-related diseases take at least ten years to manifest and, in the case of mesothelioma, can take anywhere from twenty to fifty years to become fully perceptible. This demonstrates the true danger of asbestos, as an illness can be developing for decades without you knowing. As stated earlier in this article, asbestos, if found present in a building material such as concrete, isn’t immediately dangerous. However, it will become dangerous if it is disturbed. With this in mind, when it comes to removing asbestos, it is the manner in which you remove it which is of real importance, rather than the speed. While many cases are, this isn’t always true. Asbestos is a naturally occuring mineral and, as such, asbestos fibres can be found in the air in many places. Given that commercial use has declined dramatically, naturally-caused instances of mesothelioma are becoming more common. 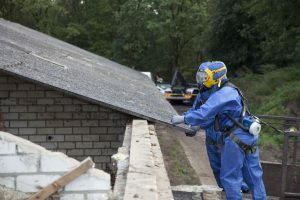 Asbestos Waste Solutions provide comprehensive asbestos waste disposal solutions to asbestos removals companies, building contractors and the general public. With over 20 years of experience we have grown to become a nationwide supplier of asbestos skips, asbestos collection vans for hire, as well as a wide range of safety equipment to make asbestos removal safe and sound for all involved. To secure maximum protection against mineral asbestos, or to learn more about our products and services, contact our team today.